A celebratory atmosphere fell upon Whelan’s to add to the Christmas cheer already in the air as punters packed into the famous Camden Street venue on a mild Tuesday December night for the last of Gavin James’ four hometown shows to round off what has been an incredible year for the Dublin singer-songwriter. A regular fixture on the Dublin open-mic circuit over the past few years, James has taken the slow and steady road to prominence, taking time to hone his craft 2015 was the year he yielded his much deserved rewards. Support slots with global superstars Ed Sheeran, Sam Smith, and Taylor Swift, sold out shows all over Europe and America, and a gold-selling album in Ireland have seen him edge closer to the cusp of world stardom having already conquered the Irish market. His three Olympia Theatre shows due to take place in January have all sold out, and tickets for this flurry of Christmas Whelan’s gigs have been like gold dust. As the main act takes to the stage, the venue is unsurprisingly bursting at the seams. With his debut album Bitter Pill only released last month, tonight’s audience is impressively familiar with each and every track, and the show starts with some of the better moments from the record. ‘Don’t Know Why’ showcases James’ showstopping voice, effortlessly gliding into the high notes that some of the female contingent of tonight’s crowd can barely reach. The beautiful ‘Nervous’ is played early on in the set, a melodic ode to lost love and the passing of the seasons, it may be the song that gives James that all important breakthrough international hit. Accompanied by a session pianist for some of tonight’s set, album title track ‘Bitter Pill’ gets the stripped down treatment tonight and is all the better for it with its soaring chorus given space to breathe without being stifled by a full band arrangement. Album track ‘22’ was unveiled prior to last month’s album release, accompanied by a thought-provoking video which ties in perfectly with the song’s tale of being teenage bullying and how James spent his teenage years wishing the days away dreaming of adulthood. When he sings ‘I remember the cold cold mornings, and I remember the rainy afternoons, when I was dreaming that I was 22’ backed by some Adele-style minimalist piano, it is a genuinely touching moment. Taking the energy up, ‘Say Hello’ and ‘Remember Me’ combine wistful lyrics with some Mumford and Sons style foot tapping, while a gorgeous cover of The Magnetic Fields ‘The Book Of Love’ is performed in hushed respectful silence. A terrifically entertaining cover of Louis Armstrong’s ‘What A Wonderful World’, in which James uncannily mimics a trumpet solo and the famous jazz man’s growling vocals leaves a smile on everyone’s face in the packed room. Briefly leaving the stage before re-emerging for the obligatory encore, The Coronas frontman Danny O’Reilly is brought onstage to perform his band’s hit ‘Heroes Or Ghosts’. Both singers’ voices combine beautifully and the added chorus harmonies give an already excellent song another layer. Tonight’s set may have been tantalisingly short, but this only served to validate the hype and the old showbiz adage ‘always leave them wanting more’ rings true tonight. 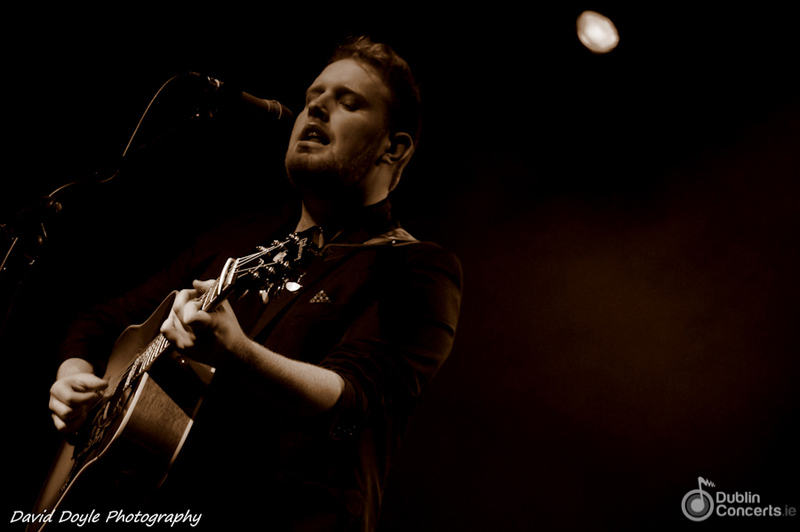 With male singer songwriters currently enjoying a resurgence in the charts, the stage is set for Gavin James to make 2016 his own. A quick glance at the writing credits on his debut album shows that, unlike some of his peers, he is capable of crafting his own hits with no outside writers, which bodes well for a long and successful career. With an album crammed with potential hit singles and his stunning vocals winning new fans with every passing week, the scene is set for Gavin James to Irish music’s next global success story. A triumphant homecoming for Ireland’s fastest rising new talent.